• Thinbands with a QUICK CLAMP fit over barrels and snap in place with an easy flip of its latching lever. • Hot change-outs are completed in seconds. 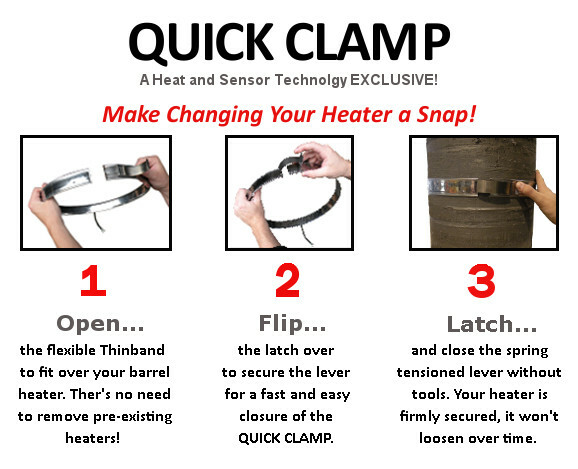 • Spring tensioned clamp keeps the THINBAND heater tight against barrel, meaning it won’t loosen over time. • Ideal for vertical applications. • THINBAND opens up to fit over barrel. There is no need to remove other heaters. • This band heater is available in selected stock, and made-to-order needs. 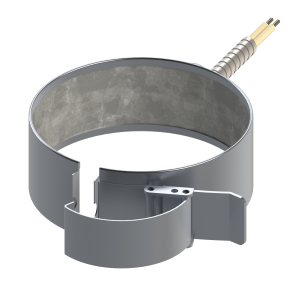 Thinband barrel heaters are available at a minimum of 100 mm (4 in.) diameter, 8 mm (1.5 in.) width. • Standard gap is 12.7 mm (0.5 in. ).